Marilyn Monroe would have loved its sparkling diamonds and rubies; Audrey Hepburn would have succumbed to the charm of its original shape; Grace Kelly would have saluted the glamour of this mechanical gem. 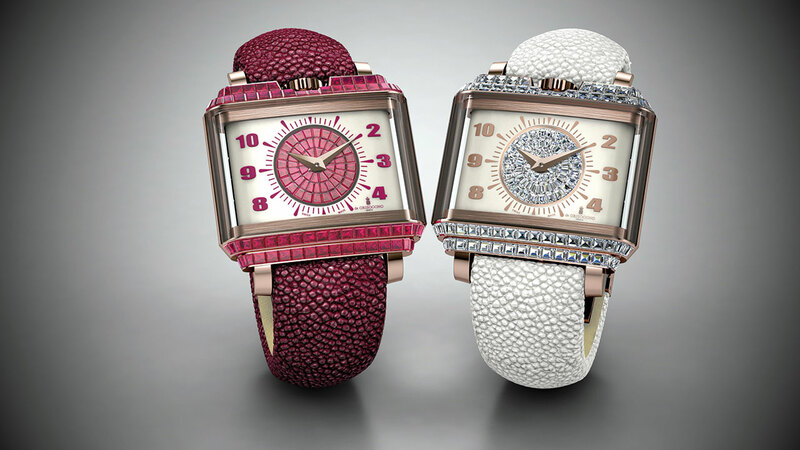 Inspired by Fifties fashions, the two versions of the New Retro Lady glow with an atypical retro-chic look. The de Grisogono style reveals its singular elegance right from the first glance. The wide rectangular-shaped pink gold case is paved with two rows of baguette-cut gems and adorned with a crown cleverly placed at 12 o’clock. The dainty gemsetting in the dial centre is a radiant expression of the de Grisogono jewellery expertise. Finally, the gaze lingers on the famous galuchat strap, a brand classic. Elegance meets opulence in the New Retro Lady models that first and foremost convey a state of mind and a determination to break free of trends so as to set the next ones. 18K pink gold set with 70 baguette-cut diamonds (3.40 cts) or 70 baguette-cut rubies (8.20 cts). Sapphire crystals, front and back. Water-resistant to 30 metres (3 bar/100 ft). Creamy white set with 60 baguette-cut diamonds (1.84 cts) or 60 baguette-cut rubies (2.20 cts). White or ruby-red galuchat, 18K pink gold triple folding lcasp set with diamonds (0.65 cts) or rubies (0.80 cts).